Buying an Ethereum Name Service (ENS) can make receiving ether and ERC-20 tokens a lot easier for you. 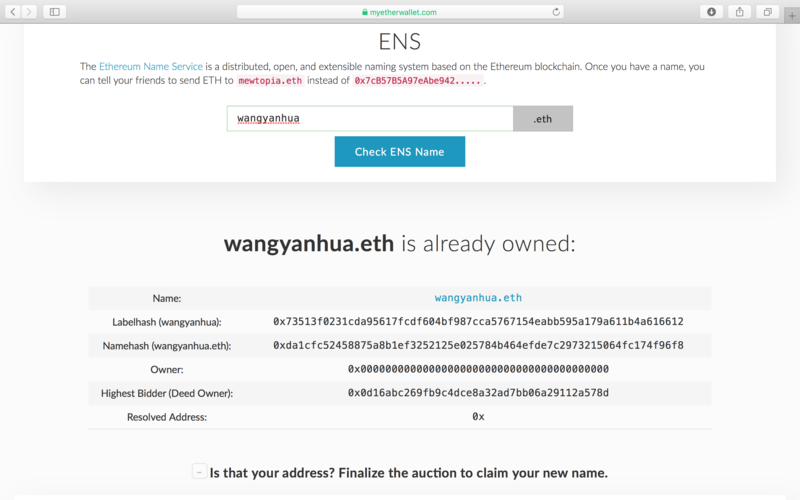 Instead of having to send your friend a long string of letters and numbers when they want to send you ether, you can give your ENS to them (for example 'wangyanhua.eth'). Think of it as a short username for your address. The process involves many steps and takes place across a few days, but if you follow this guide closely, you will find it a breeze. It is also inexpensive, and you should be able to easily get a name at around 2 USD. Go to myetherwallet.com and then go to the "ENS" tab. Enter a name and click “Check ENS Name”. Fill in “Actual Bid Amount” and “Bid Mask”. Bid mask needs to be higher than or equal to your actual bid amount. But take note that you need to actually have the amount of ETH in your account. If you think that your name is unlikely to have other bidders, you can set a low bid amount. Record down the generated secret phrase. You can change it if you want as well. Then, click on “Start the Auction”. Most importantly, take note of the reveal date. You must exercise extra care to reveal your bid (more will be explained later on in this guide) before the auction ends. Otherwise, you will lose your bid amount. 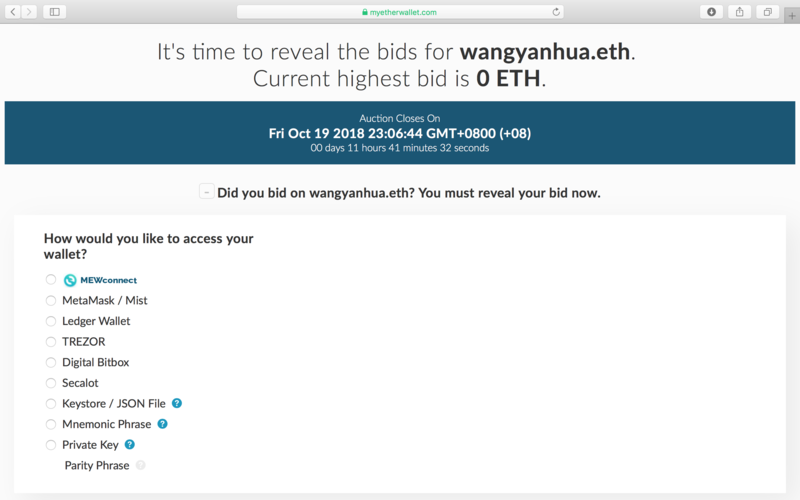 Next, check your bid on etherscan.io after a few seconds. 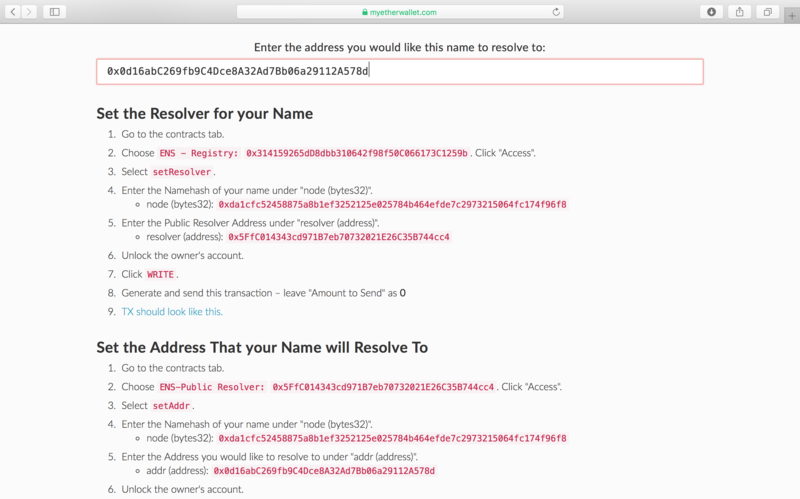 Enter your address or ENS name and see whether the transaction is successfully mined. Now for the exciting part -- revealing your bid. You are only able to do this during the reveal period. Go to myetherwallet.com and click on the ENS tab. Type your ENS name. You should see a message telling you that it is time to reveal the bid. Proceed to access your wallet. Fill in all the details and ensure that they are correct (otherwise, your transaction will fail and you will have to repeat this step, wasting ETH on gas fees in the process). Go to etherscan.io to check if the reveal is successful. If all details entered are correct, it should be successful. 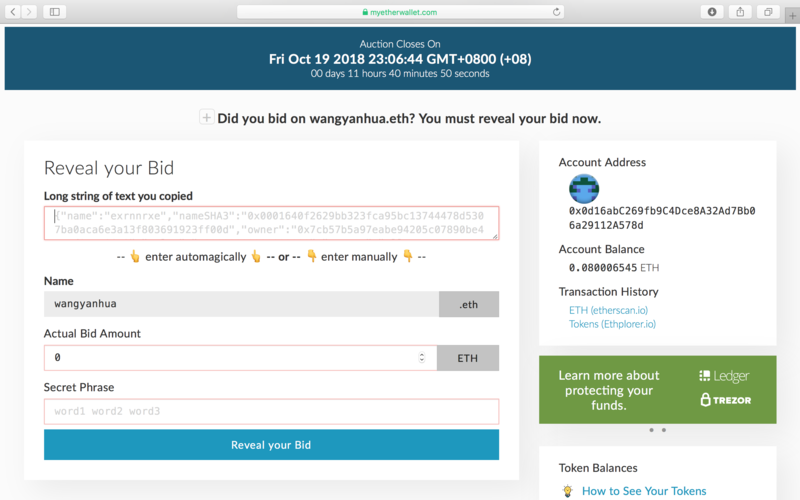 In the event that it fails, try to reveal your bid again. Wait until the auction period is over to finalise the auction. 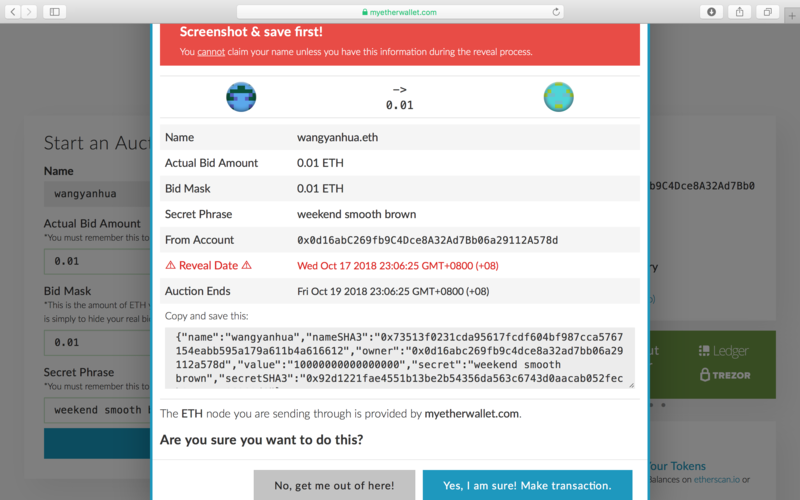 When it is time, go to myetherwallet.com again and click on the ENS tab. Enter your name. 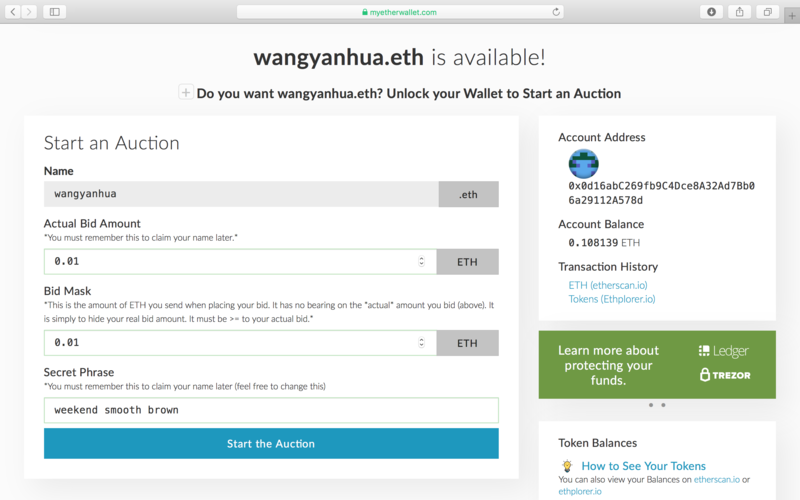 Click on "Finalize wangyanhua.eth (in my case)". Access your wallet. You are now only two steps away from having your own ENS name. All that remains is setting the resolver for your name, and setting the address that your name will resolve to. You will be provided detailed instructions from MyEtherWallet on how to do so. Click on the "Contracts" tab and then carry out these two steps. 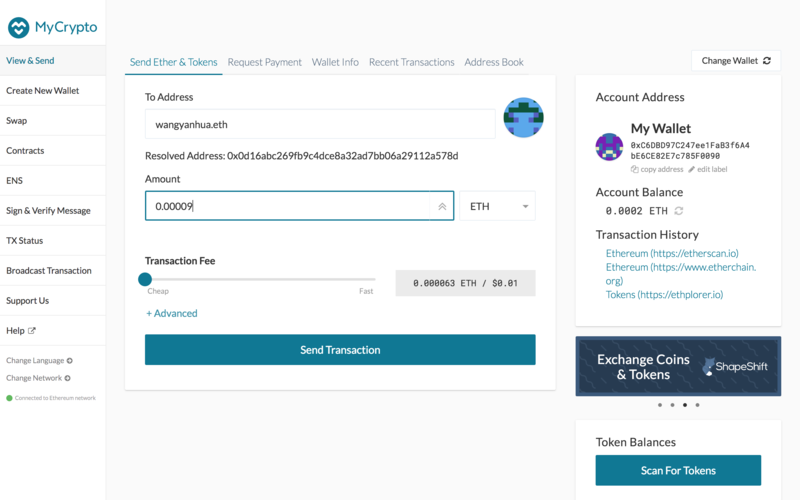 After you are done, make sure to check your transactions on etherscan.io. If the transactions are successful, congratulations! 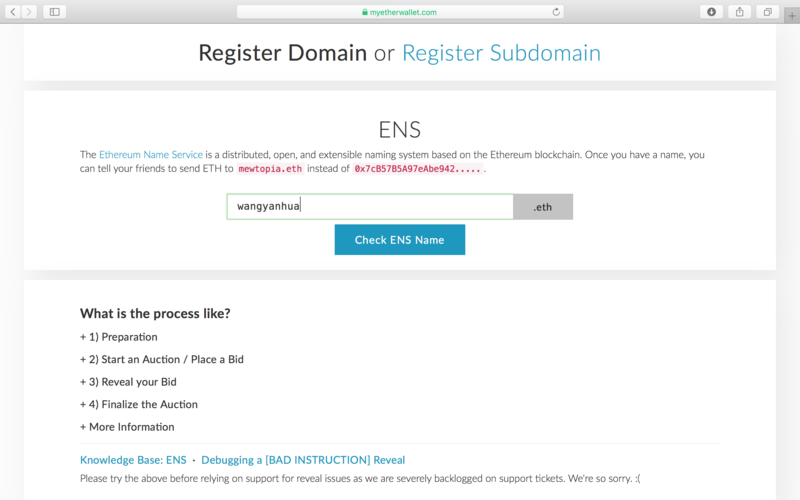 You now have your own ENS name. 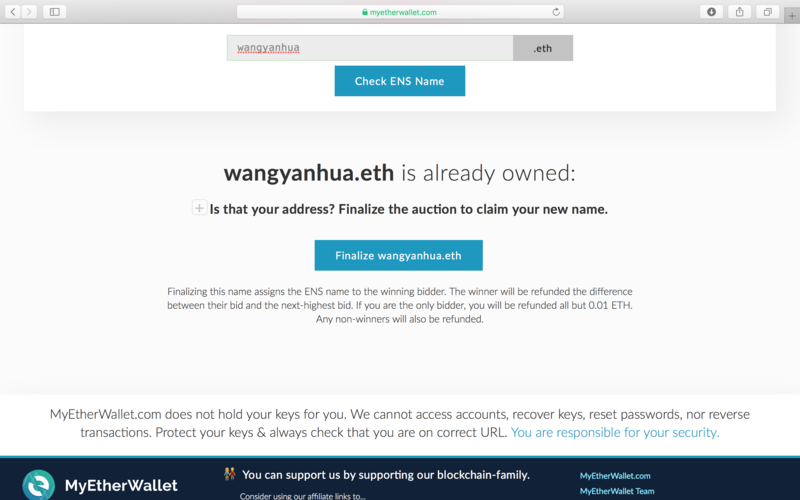 You can now try sending ETH from other wallets to this address using your new ENS to test it out! 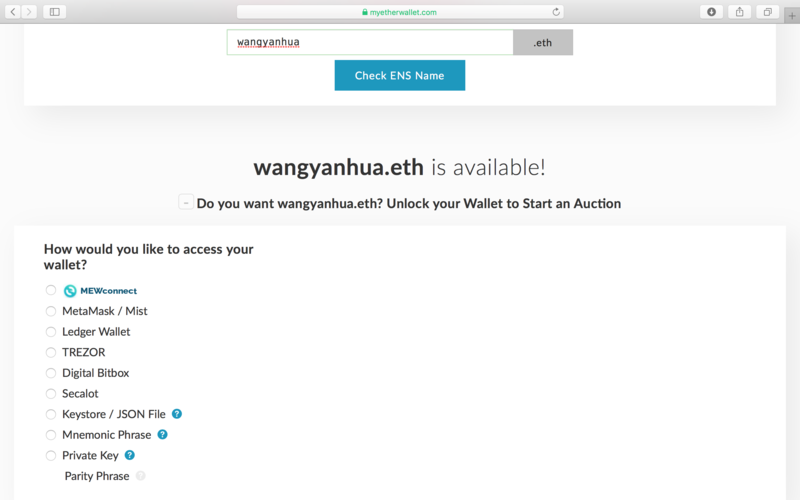 Here is a sample of me using another wallet to send ETH to wangyanhua.eth. That's the end of the guide. I hope that you have found it helpful!